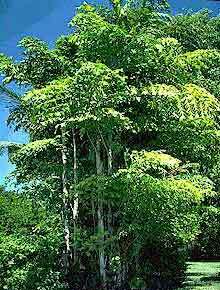 Description: Also known as Burmese Fishtail or Tukas Palm. Clustering species with leaflets shaped like fishtails. It is tolerant to low light and requires lots of water at all times of the year. Trunks grow to 150mm or 6″ in diameter. Good indoor plant.